The ranks of the Lugansk Militia grew on July 16th. Over 450 recruits are expected to take the oath over the course of the day. Almost all of them are residents of Lugansk. Among the recruits there are also women, who joined the ranks of the Militia to defend their homes. All those who take the oath today will be joined into a newly-created Paratrooper Battalion VDV, which previously did not exist in the Lugansk Republic. The recruits, many of whom had already taken part in the hostilities, were immediately issued firearms. Those for whom it will be the first time to defend their motherland can expect to go through a "Young Fighter's Course." Volunteers from our "Yovan Shevich" unit are taking active part in the battle for Lugansk. We moved out to assist the surrounded unit of the Lugansk People's Army, to deliver them ammunitions and medications, to relieve their wounded. We broke through to their positions, and the Ukrainian army was unable to block us. We remained encircling for approximately 12 hours, but were able to break out in the morning, before sunrise. We were shelled with artillery; as a result of the shelling, one of the fighters of the Lugansk People's Army died and one more wounded. We have four wounded, three chetniks and one Russian, who joined our unit. By Order of the Commander-in-Chief of the Donetsk People's Republic Militia "Considering the danger looming over the city of Donetsk, and to ensure that the measures with respect to the defence of the city of Donetsk are implemented, I hereby order: (1) That state of war be imposed in certain areas of the city of Donetsk; the border of the areas, in which state of war will be introduced, will be determined according to the developing situation; (2) That curfew be introduced; the hours of the curfew shall be from 23:00 and until 06:00 in the morning. Commander-in-Chief of the DPR Militia, Igor Strelkov"
July 16, 2014 - Situation Report from the Area of the "Southern Cauldron"
In the course of the day the columns of Ukrainian military equipment and infantry continuing their flight across the Russian border from the east to the west - through the village of Kozhevnya, then on to Novopetrovskoye, Grigorovka and, finally, to Amvrosievka. The Militia's artily is conducting periodic strikes against the enemy forces using all available calibre's. NazGuard's attempt to conduct yet another assault against Saur-Mogila was answered with a massive artillery shelling, following which the Ukrainian forces continued their retreat. The area of the Izvarino border crossing has been completely cleared of Ukrainian forces. In Lugansk, from midnight (local time) and until 03:00 in the morning, we used Grozdikas to shell the airfield, and, from 05:00 in the morning, added Grad to the mix. At about the same time, we also covered a Ukie column with Grad near Amvorsievka (DPR), in the area of the Bolshaya Shishkovka village. There were nighttime skirmishes in the area of Karlovka (the Ukie offensive was repelled) and shelling with Grad near Saur-Mogila. Over the course of the night, militiamen continued to shell the executioners' positions near Marinovka (DPR) and near the settlement of Provalye. Between Shakhtersk and Tores, Ukrainian air force, represented by 1 ground attack craft, attempted to attack a Militia column, without success. As they were afraid of being hit with a portable anti-aircraft unit ("PZRK"), the airstrike was conducted from a significant height and did not cause any damage. 10:20 (MSK) - Battles began again in the area of Saur-Mogila. Ukies are pulling together their last reserves - they are transporting Smerch, Uragan and self-propelled howitzer units from Shepetovka. 12:28 (MSK) - Ukies are attempted to bomb militiamen with their air forces in the area of Stepanovka. Ukrainian aviation is continuing to conduct airstrikes, in waves, against Saur-Mogila - the third wave (2 Su jets) just began. The Militia is hitting the aircraft with anti-aircraft units, there are also launches from PZRK. The Ukrainian air force launched 4 high-powered guided missiles at the mountain, without counting the unguided missiles ("NURS"). They are also bombing the settlement of Tarany, which is nearby. Militiamen have been successfully destroying not only the outdated machinery of the Ukrainian forces, but also the cutting-edge armoured equipment. The photograph contains the source of great pride for Ukie forces - a "Bulat" tank, recently destroyed by the Militia. Right now I am in Lugansk. Certain circumstances demand my presence. There is mortar shelling. A school is burning. Thankfully, children don't study in the summer. Another building is also burning. Ukies are attempting to breakthrough from the north. They are throwing their reserves there. We are urgently hiring. I have met many good men on the roads of war. Here is an address to the people from one of my new friends - Leshiy. His shoulder was fractured by an SVD, but he commands without a hitch. The address is read out by another man. He will introduce himself. http://www.youtube.com/watch?v=n-fx83vw8KU So that's how it is. You can believe what is said. At the time, these are the very people who are repelling the tank attack, and a number of them are engaged in evacuation 750 civilians. Local resident of Avdeevka observed a small group of scruffy men in green camouflage in the Vinogradniki district. The men were inquiring about safe passage out of DPR. Clearly, they were the inmates of the airport and yet another group of deserters. Regarding how they manage to make it out, allow me to explain: the perimeter of the airport is fairly large and the boundaries of the airport area are directly adjacent to a wilderness area that contains a nearby forested zone. With respect to the destruction of the radio-location station - indeed, we conducted an operation to destroy communications on the tower (the tower itself will still be useful to us after victory), rather than to destroy the construction itself. Electrical power cables were taken out of commission. Ukies will not be able to restore them because the territory in the area, and not only there, is wide open to easy shelling. To ensure the safety of the Militia personnel, we are implementing preventive measures aimed at upsetting the enemy's state of combat and psychological readiness. Marinovka has been taken by the Militia. The punitive forces have been totally encircled. The southern cauldron has been firmly sealed. The Ukrainian forces have only one chance to survive - to surrender to the Militia or to be interned on the territory of Russia. On other areas of the southern front, the Militia also continues an active offensive. Artillery attacks on the Junta columns are being conducted. The Militia periodically uses Grad systems. We did a bit of damage to a Su jet over Gorlovka. It left in the direction of Mirgorod garnished with a thick black tail of smoke. Don't think it will make it to the airfield with damage like that. Near the Marinovka border checkpoint on the former Russian-Ukrainian border, a battle clash between the punitive forces and our assault group is ongoing. The border checkpoint, controlled by the Ukrainian Armed Forces, was attacked with 10 tanks, 5 BTRs and 200 militiamen. Two Ukies soldiers were killed in the very first minutes of the battle. I would like to inform you that the retreat of Ukie 72nd and 79th aeromobile and the 24th mechanized brigades from the Izvarino area is gradually turning into a flight. Officers and soldiers alike are spreading panic over their telephones and other means of communication. You should be soon expecting a tsunami of calls from their relatives to the mass media. Thus, the Ukie "air force offensive" is simply a loud fart into a puddle. On the Ukrainian side of the Izvarino border checkpoint, the word "Ukraine" has been refashioned into "Ruin". LPR and USSR flags are flying over the buildings. 14:40 (MSK) - Fighting has commenced in the Metallist area (the suburb of Lugansk). The Nazi bastards withdrew out most of their armoured vehicles from Shchastye, transferring them to Noviy Aidar. A new wave is coming at Saur-Mogila. When will Ukies will finally exhaust their supply of Su-24s? PZRKs (Personal Anti-Aircraft Complex) in Snezhnoye already have already fired off their salvos at the Ukrainian aircraft. At least one Su gained serious health problems during the previous air assaults. The claim that an assassination attempt was made on the life of Ukraine's Minister of Internal Affairs, Arsen Avakov is disinformation. He is Slavyansk, healthy as ever. Pure disinfo to distract the citizens from the Khokhlo-army's defeats in the southern "intestine". The DPR Militia claim two more Ukrainian jets near Saur-Mogila. The head of the DPR Militia Press-Service, Vladislav Brig, posted on his Facebook account: "Two more Su jets were shot down. They were engaged in airstrikes at Saur-Mogila." The junta military today rolled back from Izvarino and Krasnodon (a bit earlier the information arrived that the enemy is retreating from Alexandrovka and Schastye), without solving the main problem of blockading the former state border of Ukraine with the Russian Federation. After suffering large losses and having problems with supplies, on the 15-th day of the offensive the junta military retreated by about 30-40 km from Izvarino, south of which lies the self-styled "road of life". This way, together with the growing defeat of the South punitive group and the failed attempt to unblock the Luhansk airport, the LPR militia won the strategic defensive operation which continued for more than two weeks, and the junta suffered its largest defeat since the start of the war. In essence, the charge of the mechanized forces to the rescue of the airport was a gamble by which they were trying to turn the failing operation around. In order to renew the offensive operation the junta urgently needs an operational pause, because the situation continues to get worse for it, which is why requests of cease-fire cannot be excluded in the nearest time, which of course will be rejected by the militia. The story with Mr. Khodakovsky continues. Somewhat earlier he was stripped of the direct command of the "Vostok" battalion (which was reformed into a brigade, so it has to be called now the "Vostok" brigade), which was operationally reassigned to Strelkov and his headquarters that rely on the conceal of the commanders. Over Khodakovsky, who used to be the minister of the state security of the DPR, a representative of the "Bloody Gebnya" (i.e., KGB) emerged, lieutenant-general Antyufeev who is currently cleansing the consequences of the work of those who were involved with the attempts to surrender Donetsk. A few days ago Mr. Khodakovsky was explicitly offered to determine with whom he is – either with Akhmetov or with the DPR. Because no agreement in good faith was apparently reached, then according to the data of the source, Mr. Khodakovsky today scribbled a paper about resigning from all positions in the security block of the DPR, which was dropped on the table of the political leadership of the DPR. Will it be given motion is not yet clear, but it is quite probable that in the nearest time Mr. Khodakovsky may depart from the deck of the military and political leaders of the DPR, similarly to how recently the former Mayor of Donetsk Mr. Lukyanchenko fell out of it and ran into Kiev. Strelkov: Indeed, Mr. Khodakovsky resigned from the position of the minister. But he continues to command "Vostok" and nobody is going to remove him. Sixteen wounded Ukrainian executioners were delivered across the border into Russia. The border guards and Junta servicemen wounded in the fighting are being treated at hospital of the Gukovo village in the Rostov region. The number of Ukrainian soldier being attended to by Russian doctors has grown to 16 men. Three Ukrainian border guards are in intensive care; the all received wounds of various degrees of severity. The character of wounds varies - caused by shells, frags and shrapnel, as well as fractures and burns. A source in the Militia provided information that the battle on the LPR territory is occurring only 10 kilometres away from the Russian village of Gukovo. An accumulation of disparate parts of Ukie forces can be observed in the area of Amvrosievka - this is the outcome of our morning liberation of Marinovka (DPR). In the corse of a haphazard retreat in the direction of Mariupol, significant numbers of armoured vehicles in disrepair is being abandoned "on the march" (in quotations, as it is difficult to equate this flight to a march). The evacuation of non-military personnel has been substantially hampered. We have information that separate units of the Junta forces, in an attempt to breakout from the Saurovsk cauldron, are running, stripping of their camouflage and dropping personal arms, almost naked to their underwear. Those who have civilian clothes are hastily changing, hoping to get lost among the civilian population. In Lugansk, the situation remains tense. We have radio located and now are tracking an enemy fire corrector. 20:00 (MSK) - We have received and now are confirming information about the shooting down of a transport aircraft (An-26) over Lugansk. An intensive battle has ensued at the Lugansk airport. A KPVT can be heard working, there are explosions. Near the square adjacent to the airport terminal there is thick black smoke. Two Russian paratroopers have indeed been killed. What's more, the cause of the incident was not shelling from beyond the border. A group of Ukrainian militants (presumably, Praviy Sector or the Nazi Guard) ended up on the territory of the Russian Federation (it's known whether accidentally or intentionally) and shot at the positions of the paratroopers stationed at the border. Two of them were killed. Upon the group's exit from the Russian territory the attackers were dealt with by the Militia. The larger part of the attackers has been eliminated. We have been asked not to share some of the details, but, in general, it can be said that the guilty who been punished and are cooling off six feet under. In the Gukovo area, the Russian side of the border was against subject to shelling (mortars and, presumable, incomplete MLRS salvo packets). There is as yet no information about casualties; some people have been evacuated (there is a refugee camp near the border). Observers are noting that up to 20 common and resuscitation ambulances have moved out toward the place of the shelling, which suggests casualties. There is of course no military purpose or significance to these shillings; the impotent rage of the executioners suffering defeat is understandable, considering, of course that they won't remain near the border for much longer. At 09:20, a Ukie Su-25 was shot down over Dmitrievka. "Prapor" [Note: Igor Strelkov's close friend in the Militia] was seriously wounded in his arm with two frags. It's his third time already during this war. - regarding the death of artist Pavel Ryzhenko I am grieving. He was a man full of light. When I he consulted with me, he then was already complaining that his arms were growing numb. From Snezhnoye, they are reporting that a second Su-25 was shot down with three shots from a portable anti-aircraft unit. This is the work of anti-airfact personnel of Battalion Oplot. Today at 08:40, local time, south of Mospino, in the settlement of Svetloye, saboteur-reconnaissance groups of the 2nd Battalion attacked the stronghold and the checkpoint of the enemy. One BTR, one Kamaz truck, 1 staff bus, and 1 ATGM system "Konkurs" were destroyed. The losses of the enemy (National Guard) exceeded 50 men. After the battle, the enemy abandoned the checkpoint. The remnant of the garrison left in the southerly direction. Our side suffered no losses. - What did you use to rout the executioners at the Svetloye settlement? We used 120mm mortars from very close range. What's more, we used them without targeting correction - by eyeballing the targeting - our fighters have enough experience by now. 23:05 (MSK) - According to unconfirmed information, the area of Nizhniye Kambrody was shelled using MLRS. 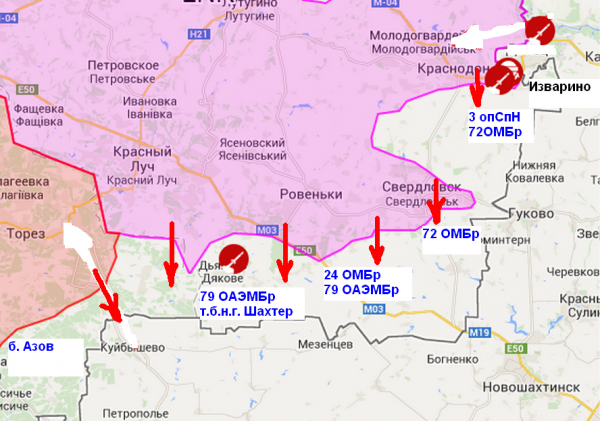 Fierce battles are ongoing in the Shchastye area. Several aircraft left in in the direction of Starobelsk. 21:00 (MSK) - The enemy has been shelling Lugansk with massive artillery strikes without interruption for the past several hours. 21:15 (MSK) - Artillery shelling of Lisichansk was commenced, coming from Krivaya Luka. 21:30 (MSK) - An MLRS worked off its volleys at the area of the Lugansk airport. According to unconfirmed information, the airport has been devastated; there is smoke rising in the Metallist district. 21:50 (MSK) - Marinovka is under the Militia's control. 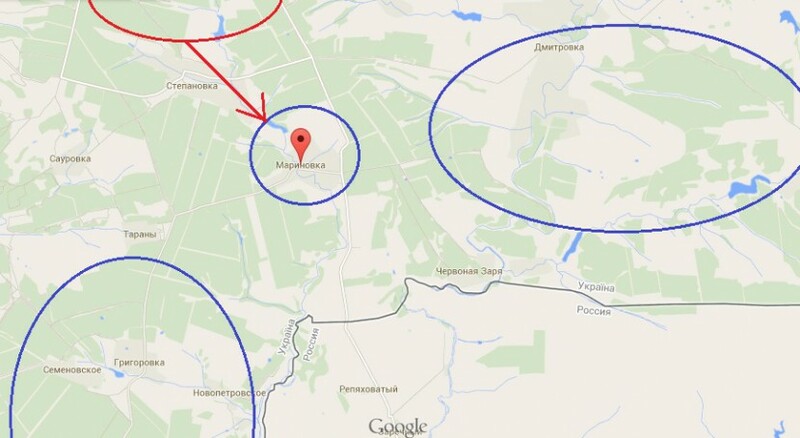 The Ukrainian Armed Forces abandoned settlement and ended up being encircled. Two Ukrainian soldiers were taken prisoner. There are also trophy armoured vehicles. Retreating, the Ukrainian forces left their heavily wounded and dead soldiers on the field of battle. [Ukrainian deserters] should be turning themselves in to the commandants' offices of the Militia. Upon voluntary surrender, and following an obligatory interrogation, the prisoners will be provided with accommodations and meals according to the norms set out for the fighters of the Militia. Thereafter, they will be able to decide for themselves whether to return home or to stay in the accommodation centres until the termination of hostilities. No one will be compelled to join the ranks of the Militia.